You are here: Home / Impact / Meagan is pickin’ and grinnin’! This holiday season, The Gift of Music Foundation was honored to join radio station 104.7 The Fish to help grant a few of their “FISH Christmas Wishes.” Here’s just one more way we were able to make a difference in a young person’s life by giving them a gift that can change their life – the gift of MUSIC. Not a common instrument wish, but Meagan just wanted a banjo more than anything else because she LOVES bluegrass music! The family lives in a very small home out in Loganville and struggles to get by. Meagan is incredibly intelligent and we can’t wait to see how awesome she will become on her banjo! 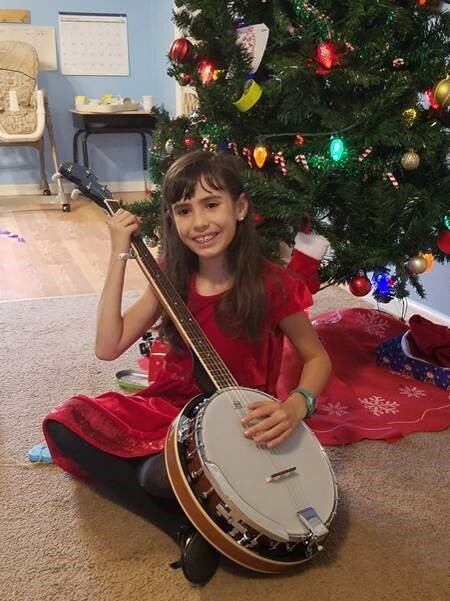 Through the support of our amazing donors, The Gift of Music Foundation was able to get Meagan a new banjo, case, and accessories including DVD’s for beginners, and the 104.7 The Fish chipped in $500 in gift cards. Look at that smile! We are dedicated to getting instruments into the hands of kids who have the desire, but not the resources to learn music. You can help us make this possible with your gift. Please give today – because music matters!